November 10 at 10:43am ·After my trip to Tennessee, I have remained silent not because I have nothing to say but I made a promise to Ben Rines and Billy Muncy that once I return to Haiti, I would work hard to have my QBN and today I’m proud to say that I have my QBN number. It’s not yet done. It’s just the first step and I know I have much more to do. The second step I’m working on is my CBA and I wish I could attend the WBC 2016 to achieve it. Oh God ! I can’t wait ! That would be a plus for me and would help me improve in that area and as a CBA, my clients will have more confidence in me and in what I do. Back to Tennessee, Ben Rines and Billy Muncy, I don’t know what to say. “Fight for what you believe in” is one of my favorite quotes and during my stay at Tennessee, I felt it, I lived it and I believe in it every day, thanks to those wonderful men, Ben Rines, Billy Muncy and Steven Jones. My second quote is the following : “Do what you love”. I don’t know how to describe that feeling I caught in their eyes, the passion felt in each explanation given to the audience, their overall ability, and every single little detail. It was not just a training. I met wonderful people that I will never forget, Ally Roberts, Francine Christopher, Louise Watkins Cba, Hill Duart, Maureen Dougher, Leslie Arnold, Liz Romani, Denise E. Bennett-Parris, Tandra Bell, if I forget a name, sorry, you are all incredible. 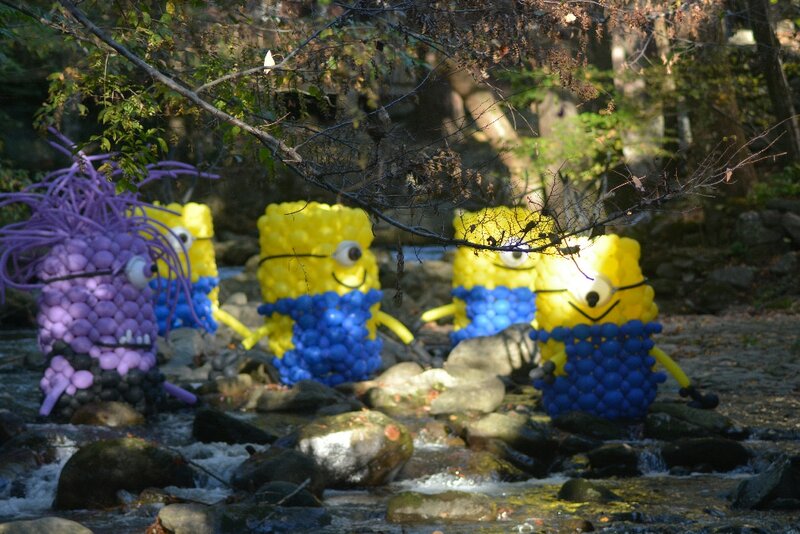 We had a beautiful parade through Gatlinburg with the Minions. Thank you for your kind attention, your friendship and I’m certain that I will see you soon. I can never thank you enough for this remarkable training, I learnt a lot from each of you and my wish for Ben Rines and Billy Muncy ,is to see the Institute grow. And to Steven Jones, that you continue to enjoy going on tours to teach everyone and who knows maybe one day you will answer to my invitation to pass by Haiti. Thanks to all of you! You are all in my heart forever! Shout out to Ben & Billy! They were wonderful hosts for the Linked balloon class.. I ordered Conwin equipment through Ben yesterday and it arrived at my store first thing this morning! This class was amazing & Ben and Billy made it a great overall experience. I would recommend that everyone check out the Balloon Training Institute !!! Wonderful! ! Hands on training and experience! ! Plenty of support after the class is finished. I am so much confident in my work now because I took this amazing class. Ben and Billy not only taught me how to create beautiful classic decor but how to save money and time doing so. I recommend this class to anyone that wants to start a balloon decorating business. Well done Ben and Billy! Amazing! And the pictures of what students learn do NOT even do it justice. If you want to take your business to the next level then you need to sign up to learn from Ben and Billy! Balloon Training Institute is hands down one of the best balloon decor training courses I have ever taken. The instructors are very knowledgeable. The hands on techniques you learn are wonderful and my favorite part is the continued support!